"...where the ocean meets the desert, and where fire meets with sage..."
I've long been very interested in Canadian glacial marine clay. I first began playing with this type of clay about ten years ago. 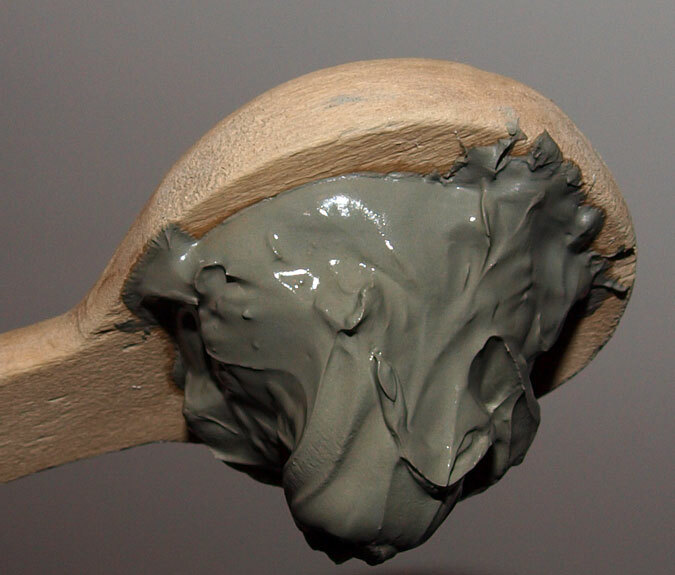 This very unique clay is an extremely clean and silty sedimentary clay that is classified as a "sticky" clay. Due to the expense involved in acquiring it, and the extreme mark-up made by companies selling it, I never viewed it as highly marketable. I've watched company after company try to market this type of clay, only to go out of business shortly after beginning. One of the significant errors usually made is that proponents over-hype the clay's benefits while completely ignoring its limitations. My view changed a bit when I was contacted by a Canadian Artist named Theresa Marie who had been hand wildcraft harvesting this clay for quite some time. Wildcrafted was the only kind of glacial clay I was interested in. For this particular clay, my source really needed to be a completely raw source, with absolutely no drying, milling or processing. Furthermore, the location of the deposit was absolutely ideal for my purposes: Her clay was actually an ocean tidal clay which was also subjected to glacial water run-off. The clay has also been subjected to waters from a thermal hot spring. Black and brown bears have been observed eating this clay shortly before the annual winter freeze. After experimenting with it for awhile, I was certain it was rich in ORMUS/ORMES. I was pleased because it was hundreds of time better than other sea clays I'd experimented with (such as Russian/European sea clays). The marketability of the clay is still a bit limited due to the cost of acquiring the clay. In order to reach the location, Theresa has to travel by sailboat and painstakingly harvest the clay; it can only be done a few times of year due to weather restrictions. 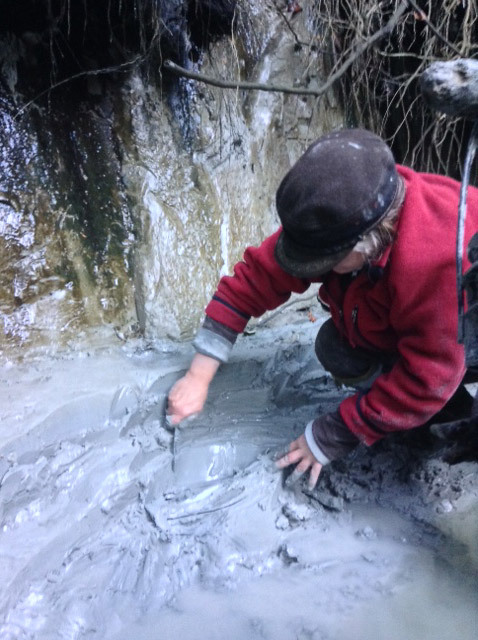 While exploring raw clay deposits and wildcrafting clays can be a very enjoyable experience (one of my personal favorite activities), it can be very time consuming and hard work. I decided to undertake the inviting challenge of tempering this clay for cosmetic/skin care use..
Sea clays are loaded with therapeutic minerals, including an abundance of chlorides. Amazingly powerful for skin use, they also tend to be incredibly drying, sometimes acting as outright skin irritants. I needed to greatly reduce this effect, while harnessing the mineral content, the texture, and the beautiful color. The end result needed to a be a very powerful clay masque product, but one that didn't overly irritate normal, healthy skin. Ultimately, I ended up developing a proprietary water formulation specifically for this clay blend, which inlcudes the use of a bicarbonate solution and a silver hydrosol. 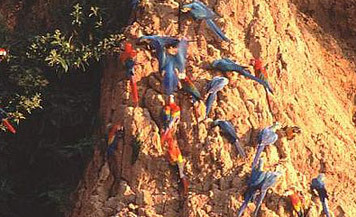 The water used to hydrate clay is equally, sometimes even more important, than the clay itself. I combined this wild and unwieldy tidal clay with our sharply contrasted green desert clay, and then added Morrocan Lava clay for some extra body. Finally, I added a lipid-rich blend of organic essential oils well known for skin conditioning. Modified RO Water, Green desert caclium bentonite, Canadian Glacial Marine Clay, Moroccan Lava Clay, Organic Argan Oil, Organic Rosewood Essential Oil, Organic Geranium Essential Oil, Organic Chamomile Blue Essential Oil. First, apply a very thin tacking coat of clay to the face, rubbing it into the skin. When finished, apply a thicker coat of clay to the face. Allow clay to set for 5-10 minutes. Ideally, use a floral water spritzer/spray to prevent clay from completely drying as needed. Rinse completely with warm water. Follow by rinsing with cool water. Towel dry face. When using this clay for the first time, don't use any moisturizer after use. 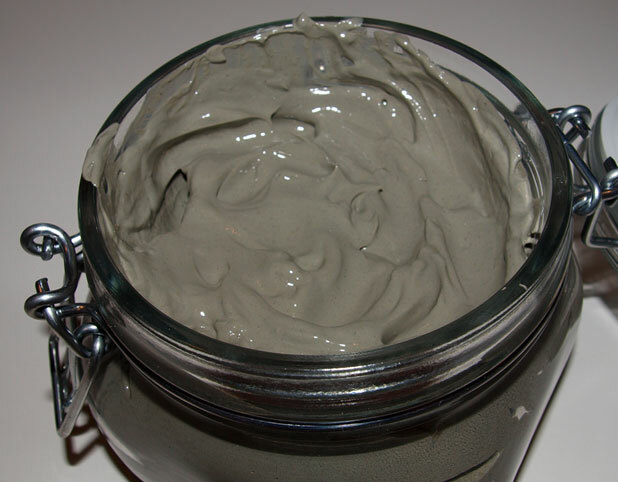 This clay is an excellent skin testing clay (in Auyervedic medicine, it is sometimes called clay/mud scanning). When applied to very healthy skin, the skin does not become overly dehydrated, and is fully restored within two hours; it has an excellent clean and smooth feel with balanced, healthy oil content after four hours. Damaged skin (dermal layers) will temporarily feel dehydrated. Note any isolated patches that may feel dry. Remember that powerful clays draw out impurities from the skin, deeply cleansing the pores. If one is dealing with very dry and damaged skin, one may wish to consider our three clay external use Tecopia Essentia Blend (clay powder). Use this clay about three times weekly to support healthy skin.